The result is Doctor Who - Paternoster Investigations. This book is a source guide to the Doctor Who universe's Victorian England. The Doctor has been here many times and he is seriously running the risk of running into himself more often here than in 21st Century England. The book is 128 pages, full color and done in the new "12th Doctor" trade dress. 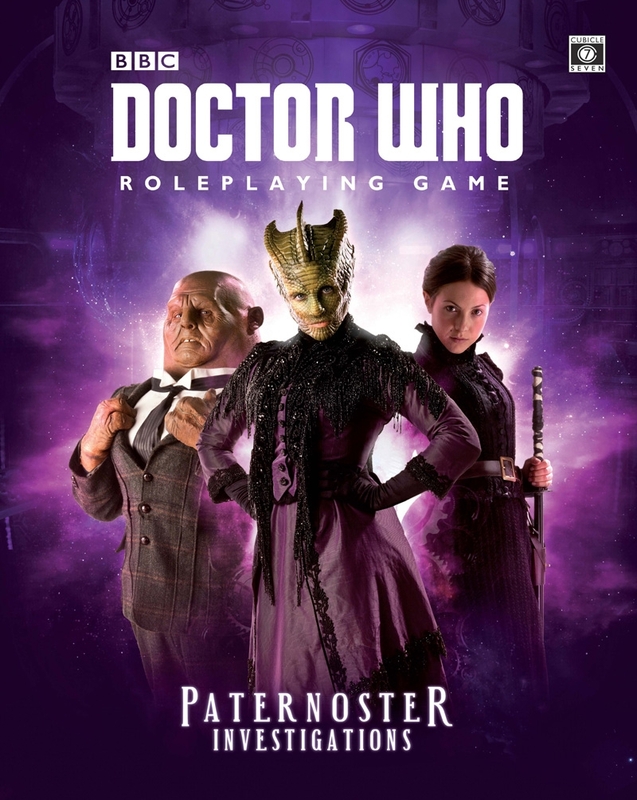 The main conceit of the book revolves around the Paternoster Gang which includes Silurian warrior, Madame Vastra, her maid turned lover turned wife Jenny Flint, and Sontaran Commander turned nurse turned man-servant Strax. I have featured Vastra and Jenny many times on my blog and worked out my own stats for them for the Doctor Who RPG and for Ghosts of Albion. I have not bothered to see if my stats and the official stats are similar though. You will not see the depth of talking about Victorian times here as you would with the author's Victoriana books, but there is still plenty here. The second chapter/section is devoted to the specifics of the Doctor Who version of this time. This features a "driving" geography of London (useful for anygame) and some personalities that can be interacted with. A pause while I point out how pleased I am to see "Alice Shield" AKA Ashildr AKA "Me" from the ninth season of Doctor Who. No, we never saw her in Victorian times, but we know from her accounts that she was there. We even get a first generation version of Torchwood. Third, we get to Victorian Adventures which is exactly what is says on the tin. So many great ideas here. I could not help but feel a little Victoriana entering here. The jewels in this chapter are of course the descriptions of the PPaternoster Investigations Gang, the "Further Adventures of Jackson Lake" (the Man Who Would Be Lord) and my absolute favorite, Jago and Litefoot Investigations. Right there is worth the price of the book alone. Ok let's push pause for a sec. One of the big issues of Doctor Who, any Doctor Who RPG, is playing without the Doctor or Other Timelords. UNIT helps this a little, Torchwood does it a little better, but the Paternoster Gang does it the best. With this structure you may never need, or even may never want, to use a Time Lord in your game again. This details setting up and running your investigative teams or using one of the ones from the book. The final chapter, "A Study in Flax" is an adventure for your Victorian investigative team. The final pages are various characters from different Victorian episodes of Doctor Who. Included are Vastra, Jenny, Strax, Jackson Lake, Rosita "Rose" Farisi, Henry Gordon Jago (! ), Prof. Litefoot (! ), another version of Clara, and Victoria Waterfield. Seriously though, if you enjoyed the Vastra/Jenny episodes of the 11th and 12th Doctors, the 4th Doctor classic "Talons of Weng-Chiang" or it's spin off "Jago and Litefoot", then this is for you. Just buy it. You'll love it.